Originally manufactured by Treesse in Italy as Gen-X, the Baby-boomer walk-in bathtub has been reengineered by Aquatica to address various US safety and electrical standards. The Baby-boomer walk-in bathtub is intended for corner installations with a safe and transparent curved acrylic door on its corner, which opens inwards to save bathroom space. The tub’s design was inspired by a marriage of classic and modern styles to please many and fit most bathrooms. 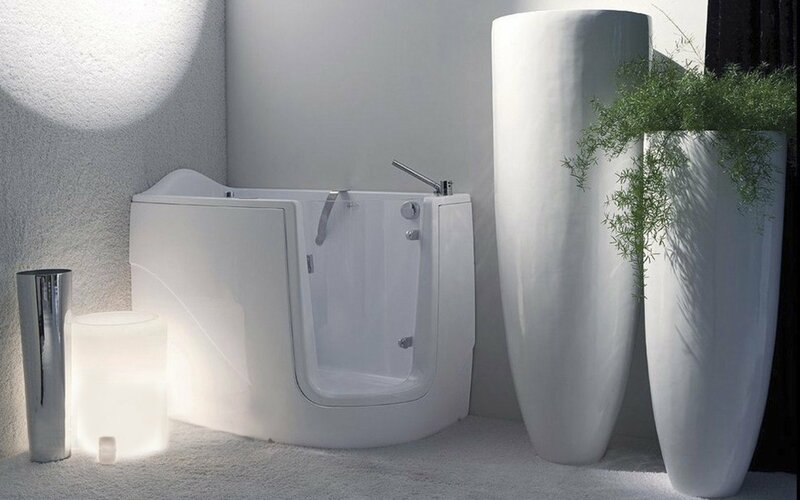 The tub’s interior is designed for maximum seating comfort even though it’s very small. By introducing the Baby-boomer walk-in bathtub Aquatica has proved that even space saving solutions could provide a lot of comfort by equipping this tub with our signature Tranquility water heating, hydromassage, oxygen therapy, air-massage, chromo-therapy and Multiplex electronically controlled thermostatic faucet/bath-filler add-on options. The Tranquility bathtub heating system was designed to eliminate the hot water adding hassle and maintain the water temperature at a constant 104F /40C (41-45C in Europe and other markets). The built-in Tranquility heating system is utilizing a low flow/high-efficiency ultra-quiet pump. Equipped with minimalist control panel, a standard 1.5kW inline water heater (US), Bluetooth audio system, and underwater LED сhromotherapy system, the Tranquility system provides the ultimate luxury bathing experience. Note: While the North-American specific Baby-boomer walk-in bathtub is visually similar to the European Gen-X, it differs in practically all features – drain, overflow, faucets, installed therapy options and systems, massage nozzles, electrical requirements. All US therapy models like the Baby-boomer Relax, Baby-boomer Tranquility, Baby-boomer Oxygen and Baby-boomer Spa are complete US plug&play systems that require 1-3 dedicated GFCI equipped 110V/20A circuits. Now you don’t need to rely on your hot water tank for hot water for your bath. Instead enjoy continuous hot water with our Tranquility system and extend your relaxing bathing experience for as long as you want. At the touch of a digital keypad. 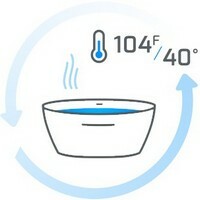 Set the temperature to 40C and the powerful heating element will react to water temperature changes and heat the water. The heating system is ultra-quiet and equipped with a safety timer, which turns off after 20 minutes which can be turned on again, if you wish.